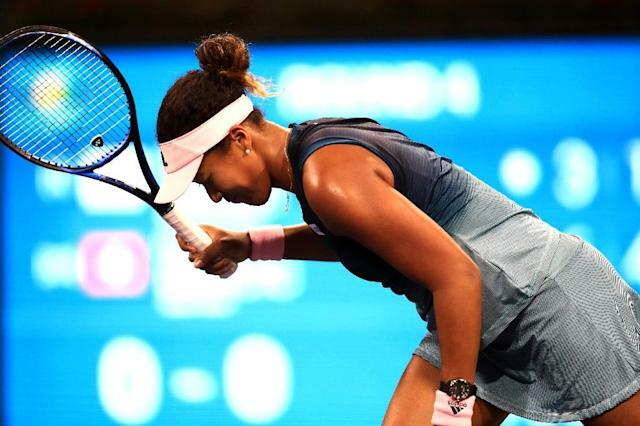 Indian Wells (United States) (AFP) - World number one Naomi Osaka was trying to find the positives after her Indian Wells WTA title defense went up in smoke on Tuesday. The US and Australian Open champion found at least one. "I didn't lose in the first round. That's a plus," Osaka said after falling in the fourth round 6-3, 6-1 in just 66 minutes to red-hot Belinda Bencic of Switzerland. Osaka conceded she didn't play well, but she didn't find the lopsided scoreline depressing because "I tried my best and I don't really have any regrets." Osaka had won nine straight games at Indian Wells, but Martina Navratilova in 1990-91 remains the only women's repeat winner in the event. Osaka said the first title defense of her career had brought different challenges, and she thought she handled them well. "I think I did well," she said. "It's just really exciting to come out here every day and for everyone to be so kind. There were so many fans, I think that that's part of the experience. Yeah, I think I did well for my first time." She said she could see a change in herself since she arrived unheralded at Indian Wells last year and walked away with a victory that sparked a stellar 2018 campaign that included a win over Serena Williams in the US Open final. "One of the biggest things is I wanted to be more mature," she said when asked how she had changed. "I feel like this is something I'm still working on, on and off the court. It's one of the biggest goals that I have had my entire life. "Because I might have thrown a few tantrums last year and this year it's something I'm working on improving and I feel like it's going well. "I think I'm just more confident in myself." She's also confident that her decision to bring American coach Jermaine Jenkins into her team is working out. Osaka surprised the tennis world when she parted with coach Sascha Bajin shortly after winning the Australian Open and moving to number one in the world. "I think it's always a bit tricky whenever you change someone in the team, but I feel like for a first tournament we did really well," she said of her partnership with Jenkins, a former US collegiate star who served as a hitting partner to Venus Williams from 2015 until the end of last season. "We communicate well. So I think that's a really big plus. I don't think it's going to be difficult. I think that we are all sort of on the same page, and we are all looking forward to Miami," she said. "Yeah, I think it should be good."